The incremental cost of building a zero-energy or zero-energy ready home is modest in Climate Zones 2 through 5, an analysis by the Rocky Mountain Institute found. A recent Rocky Mountain Institute report, The Economics of Zero-Energy Homes: Single-Family Insights, makes the case that not only is this vision becoming achievable, in some locations in the United States the economics are in place today to make cost parity (almost) a reality. And in one New England location — thanks to progressive incentives and energy codes — it is a reality. In our report, we analyzed four cities — Houston, Atlanta, Baltimore, and Chicago — to determine the current incremental cost to build a zero-energy (ZE) or zero-energy ready (ZER) home in Climate Zones 2 through 5 (where 90% of new construction homes are built) to determine the most cost-optimal energy upgrade package. ZE homes produce or procure as much renewable energy as they consume over the course of a year. ZER homes are designed to achieve ZE levels of efficiency but don’t yet have photovoltaics. We found that the cost increase to build a ZE or ZER home is modest in all four zones, with incremental costs averaging 7.3% for ZE homes and 1.8% for ZER homes — far less than consumers, builders, and policymakers may realize. To scale the results of our four-city analysis across the country, we used R.S. Means to adjust the labor and material costs, PVWatts to adjust the solar resource, EnergySage to adjust the solar cost, and the Pacific Northwest National Laboratory’s analysis of the International Energy Conservation Code (IECC) to adjust incremental costs in relation to local energy codes. We did not factor in local incentives. 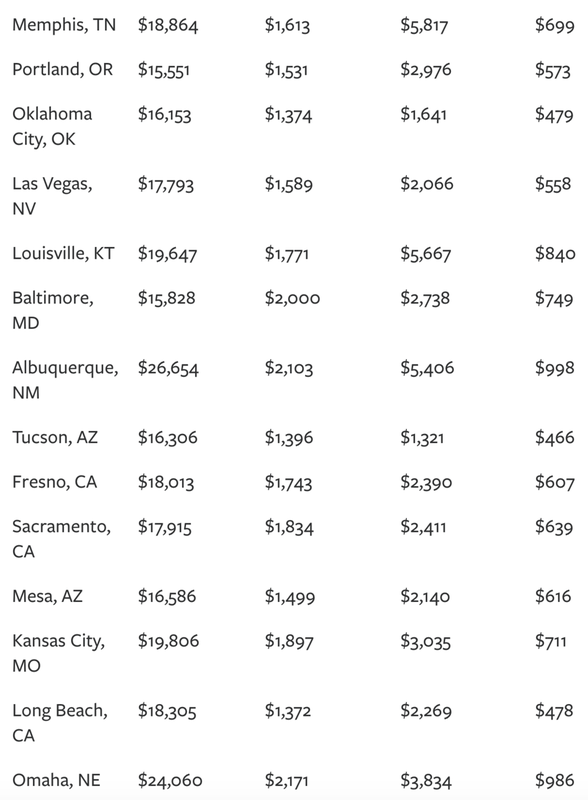 Using this approach, we approximated the incremental cost in the 47 most populous U.S. cities (see the table below). At a 1.1% incremental cost, many cities on this list may have incentives available that could result in cost parity for ZER homes. This is exciting because ZER homes can be built anywhere regardless of solar resource and roof design, and so are incredibly scalable. For example, Chicago has a stronger building energy code than the modeled baseline (IECC 2015 versus 2009, respectively). ComEd, the utility that serves Chicago, offers incentives for appliances, smart thermostats, heat pump systems, and heat-pump water heaters. 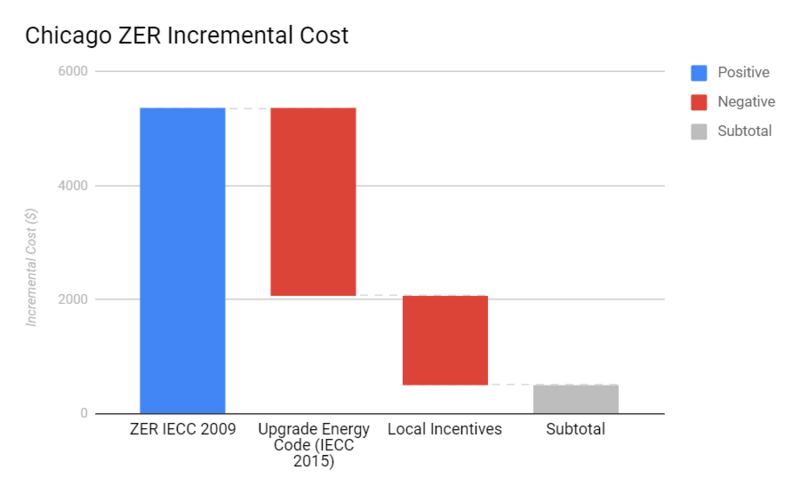 The combination of stronger energy codes and solid local incentives brings the incremental cost of a ZER home in Chicago from $5,368 to $495, as seen in the bar graph below. At this incremental cost, ZER homes would pay back in less than a year through utility bill savings. Enter third-party-owned solar financing. There are two types of third-party-owned solar financing methods: a solar lease and a solar power purchase agreement (PPA). In a solar lease, the customer pays a specified amount every month, regardless of the system’s energy production. In a solar PPA, the customer pays a specified amount per kilowatt-hour of generation, so the amount paid varies monthly as a function of generation. In 2017, 41% of residential solar was third-party owned, so this is a common model. By utilizing third-party-owned solar financing, builders can build a ZER home and, at no additional upfront cost, turn it into a ZE home. Further, in some locations, solar PPA or loan providers can offer contracts that provide homeowners with cheaper electricity rates than those available through utilities. Notably, Lennar, the second largest builder in the United States, recently created a PPA that sets the solar price 20% below utility rates for 20 years. This means homeowners will pay lower utility bills than living in a ZER home, and all their energy consumption will be offset by solar. Many cities are close to achieving cost parity for ZER and ZE homes, and city policymakers can take action to help push them across the finish line. Stronger energy codes will bring the bar higher for all new construction homes, and therefore lower the incremental cost of ZER. Additionally, city policymakers can work with the local utility to provide comprehensive incentives for homes that are performing significantly better than code baseline. Finally, to help ZE homes achieve cost parity, city policymakers can encourage businesses to offer PPAs and solar loans by working with utilities to offer favorable interconnection and net-metering policies and by providing clarity around any legal or regulatory requirements for third-party solar ownership models. To learn more about The Economics of Zero Energy Homes: Single Family Insightsreport, check out the Zero-Energy Homes Are Ready for Mainstream Markets blog or this webinar summarizing the report. Stay tuned for an update that includes Climate Zones 6 and 7 and a similar report featuring multifamily buildings coming out in the first quarter of 2019. Alisa Petersen is a senior associate on Rocky Mountain Institute’s Buildings team. ©2018 Rocky Mountain Institute. Published with permission. Originally posted at RMI Outlet.